Global Exoskeleton Market is expected to reach USD 8,300.00 Million by 2025 from USD 528.30 Million in 2017, at a CAGR of 41.2% in the forecast period 2018 to 2025. The new market report contains data for historic years 2016, the base year of calculation is 2017 and the forecast period is 2018 to 2025. The major factors driving the growth of this market are geriatric population, advent of robotic technologies and increased investment towards exoskeleton technology. On the other hand High equipment cost may hinder the growth of the market are the factors which will boost the global exoskeleton market. The global exoskeleton market is segmented based on component into two notable segments; hardware and software. Hardware is sub segmented into actuator, sensor, control system/controller, power source and others. Actuator is further sub segmented into electrical, pneumatic, hydraulic, piezoelectric and others. Sensors are further sub segmented into force sensor, accelerometer, gyroscope, tilt sensor, position sensor, microphone and others. In 2017, hardware market is likely to dominate market with 76.1% shares and is estimated to reach USD 6269.05 million by 2025. It is growing at a CAGR of 41.1% in the forecast period. The global exoskeleton market is segmented based on mobility into two notable segments; mobile and stationary. In 2017, mobile market will dominate with 75.5% shares and will consume around USD 6,345.92 million by 2025. It is growing at the highest CAGR of 41.4% in the assessment period. The global exoskeleton market is segmented based on type into two notable segments; powered and passive. In 2017, the powered market is estimated to dominate market with 75.5% shares and will collect around USD 6,192.04 million by 2025, rising with the CAGR of 41.0%. The global exoskeleton market is segmented based on body parts into three notable segments; lower extremities, upper extremities and full body. In 2017, the lower extremities market is estimated to dominate market with 57.7% shares and will collect around USD 4,801.07 million by 2025, rising with the CAGR of 41.2%. The global exoskeleton market is segmented based on end user into three notable segments; healthcare, industrial, defence or military. Healthcare is sub segmented into rehabilitation and elderly care. In 2018, healthcare market is expected to dominate market with 50.0% shares and is estimated to reach USD 4,136.68 million by 2025, growing at the highest CAGR of 41.1%. Some of the major factors driving the market for global exoskeleton are growing geriatric population, advent of robotic technologies and increased investment towards exoskeleton technology. High equipment cost is the factor which may hinder the growth of this market. 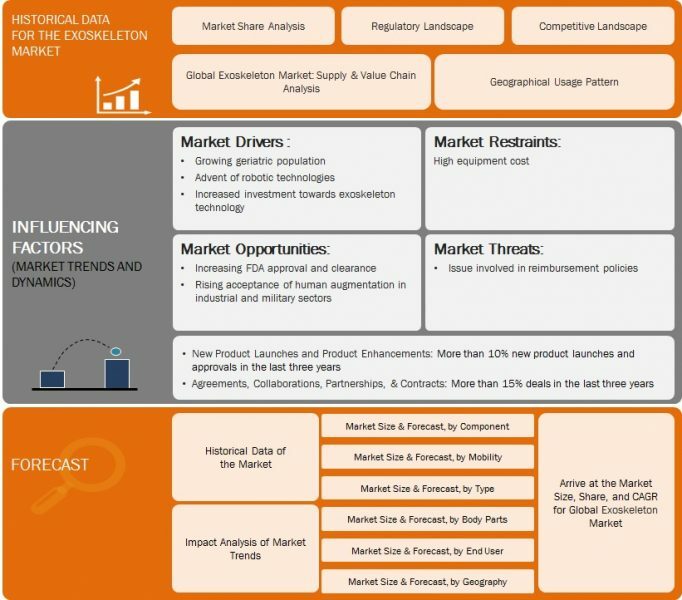 Raytheon Company is going to dominate the exoskeleton market following with Esco Bionics, EXHAUSS, SUIT X, Hocoma, Rex Bionics Ltd, ReWalk Robotics, RB3D, Raytheon Company, PARKER HANNIFIN CORP, ottobock, Fourier Intelligence Co., Ltd, DIH Technologies Corporation, B-Temia, Focal Meditech BV, Cyberdyne, Inc., Bionik Laboratories corp., Lockheed Martin Corporation, GOGOA, Honda Motor Co., Ltd. and among others.